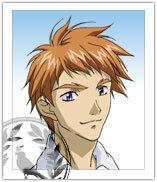 Alfred Visconti, commonly known as Red, is an extremely popular Hollywood star whom both Yuuta and his sister admire. He seems to come from America and uses English words in his speech from time to time. His family is closely connected to movie-making industry. His grandfather Vittorio Visconti is a well-known film director. His father, Johnny Visconti, is a Hollywood film producer, his mother is a popular actress, his two older brothers are young directors and his younger brother Tony is a child star. However, Red has a tense relationship with his father who is quite one-sided towards movie-making business. Alfred is usually loud, rough and quite straightforward, which causes him to look rude. He is good at fighting and riding motorbikes. In the band "Red Prince" he is a guitarist and singer.